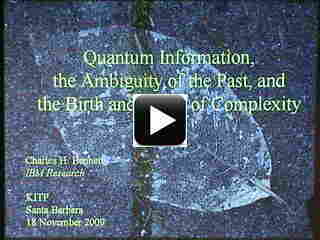 Quantum information theory provides the most coherent explanation of the emergence and obliteration of correlations, even in macroscopic systems exhibiting few traditional quantum hallmarks. Turbulence is a familiar example of a process generating not only correlations but awe-inspiring complexity, and it is natural to wonder where this complexity comes from and how long it lasts. We discuss the central role of entanglement in the origin and obliteration of correlations, then attempt to apply the theory to understand the birth and death of complexity, appropriately defined.